Are you reopening the Daily BR? Only for today. I thought I would clarify the air as I did not realise I had a cause a little stir in Brunei's blogging community. I haven't had time to read other people's blogs since I came back last Sunday so I don't really know what the undercurrent was. It was when I had lunch this afternoon with one of my avid readers that I realised the extent of the uncertainty. He was under the impression that I stopped because I was asked to. The answer to that is no. I stopped because I wanted to. Why stop the Daily BR? Nothing much for my final posting. 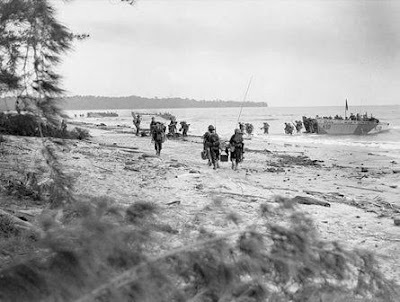 Just the final set of photographs depicting scenes of destruction in Brunei during the Second World War as I promised about a week ago. 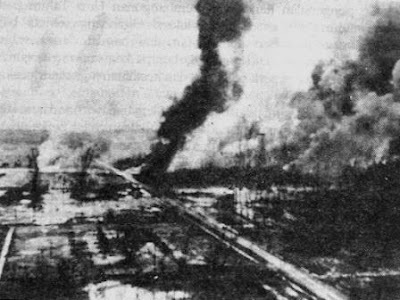 The first photograph is the scene of destruction in the Seria Oilfields. The others are scenes from Brunei Town and Brunei District. 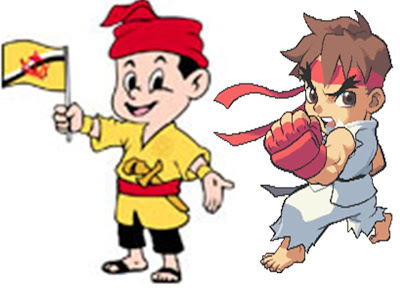 These are just to remind us just how much progress we have made since then. Thank you to everyone for your support throughout the last 2 years. It has been an exhausting two years and it's time to pack up and concentrate on work, my writings (published ones) and continue to maintain my main website at www.bruneiresources.com which I have neglected. Thank you for all the nice and wonderful comments - I enjoyed those. The critical ones too, I thank you too. They make me think. For those who wonder what will happen to the more useful postings here, do not worry. They will be uploaded as proper articles on the main website (when I get round to it). On that note, thank you and good bye. Tak hendak seribu daleh, hendak seribu jalan. Bila terlalu banyak masa, terutamanya di waktu malam, apabila kesunyian di Kota Tokyo ini, banyaklah ilham yang didapati dan banyak juga perkara yang boleh dilakukan. Saya masih ingat satu pesanan yang telah dimasukan ke dalam kotak 'the shout box' yang menekankan bagi Bahasa Melayu untuk dipromosikan dan digunakan. Khusus untuk hari ini dan mungkin juga di hari-hari yang lain, saya akan cuba menulis catatan harian ini dalam Bahasa Melayu yang rasmi. 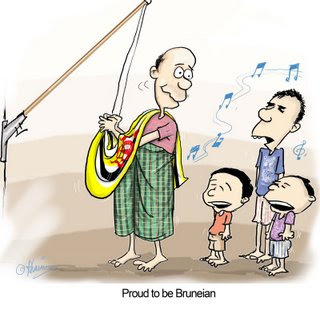 Sebagai Bangsa Melayu Brunei, kita sepatutnya lebih mengutamakan Bahasa Melayu tetapi rata-rata kebanyakan blog Brunei adalah dalam Bahasa Inggeris. 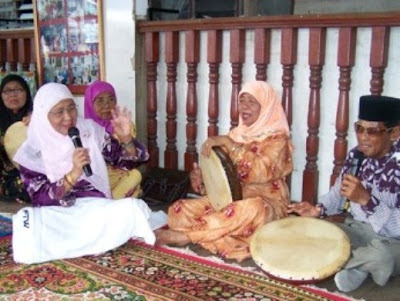 Tiga 'blog' Melayu Brunei yang perlu dijadikan sebagai contoh yang saya lawat jika ada kelapangan ialah rosapadena.blogdrive.com, ninasuria.blogdrive.com dan ninasayu.blogspot.com. I am still in Tokyo. Yesterday during lunch time, we were caught in this massive traffic jam when we were heading back towards the hotel. We already heard the loudspeakers blaring whatever messages the demonstrators wanted to shout out during our meeting. Not being a nihon speaker we did not know what they wanted. When we came out, we saw an interesting sight of demonstrators with multicoloured banners demonstrating against the visit of the Chinese Premier to Japan. I did not dare take any photographs and the positioning was wrong. The last time I took a photograph of demonstrators was in Islamabad, Pakistan and a whole group of demonstrators chase the taxi I was in. We were wondering why protest at the MOF Building until the driver told us that the MFA Building was across the street, so they were aiming their protests there. Throughout the whole day, there were lots and lots of policemen. We even met up with the whole entourage on the road on our way back from dinner. Our negotiations don't start till this morning. It ain't going to be easy - that much we know. So we spent the whole morning yesterday strategising and preparing at the hotel. It was late afternoon before we managed to get some free time but it was raining - so just soggy photographs of Tokyo. Forget about compositioning - just quick snaps from the car. We tried out the sashimi (the raw fish) for our 3 pm lunch and it was cameras out for everyone taking photos of the food before swallowing it down. We had unagi (eel) the day before. In the evening after an enjoyable dinner with the Brunei Ambassador, we went out for a drive to see Tokyo at night. All blurry photographs taken from the moving car using my compact FujiFilm f30 using natural lighting only. My apologies for those expecting something on Brunei - come back on Monday. For the next few days, travel blog photos from Tokyo. Today, place photographs from Ameyoko, the gardens of Imperial Palace, Akasaka Temple and Asakusa. 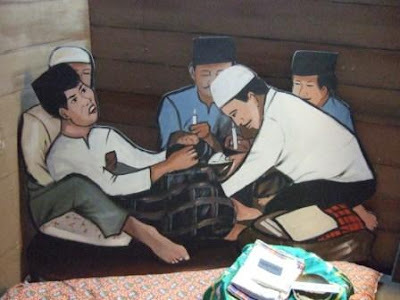 In Brunei and in Indonesia, circumcision is known as bersunat but in Malaysia, berkhatan. In the earlier days, bersunat is considered as the mark of a true Muslim. Immediately just before the circumcision, the boy would be asked to recite the ‘kalimah sahadat’ which is the recitation every Muslims or would be Muslims undertake to declare themselves as Muslims – thus by saying it just before the circumcision, made him a true Muslim. My just turned 7 years old son was circumcised during the school holidays. He was scheduled to have done it together with a few of his cousins and anak buah last December but missed it as we were on holiday in KL. So this March, we had ample time to prepare. There is normally a fairly long queue at RIPAS, so it is best to book a time early. There are also a couple of private clinics which offer the circumcision services. The circumcision procedure of today is very much different than that when it was done to me about 30 odd years ago. Today, we are given choices as to whether we want it done using a General Anaesthetics (GA) or a local one (LA). For a GA, one has to go a couple of days earlier to meet the anaesthetist. Generally this is available to younger children but some of the older more scared kids may ask for it. According to the Doctor, some 25% of boys chose GA. For those who wants to know the difference, the GA sends the boys to sleep but with the LA, they are awake. I was staring at the computer last night raking my brain for today's topic when I heard someone being interviewed about 'memukun' on Rangkaian Nasional. Rangkaian Nasional has a program where people can actually sing through their telephones - a duet with another singer in the studio. I remembered in the 1980s when 'memukun' first appeared on national radio. A number of people who were trading at the tamu recorded the nightly programs and played their casettes at top volume. You could not escape from it if you are there. Anyway, I thought the interview is worthwhile reproducing here.